He was greeted by hordes of fans, journalists and photographers the second he landed. It wasn't long before a very leggy Rafa was in a press conference to be asked the usual questions. "I have good feelings about competing in Brazil. I have a great connection with the fans here. This country is very special and I hope to enjoy the experience. "I think that tennis has to move to places where there is love and passion for the sport, so it is important to have tournaments in South America. Tennis is a global sport, so to have tournaments in new places is great for our sport. Cities and countries in Latin America have developed a lot over the years, so it is good to see tournaments are getting bigger and bigger in this part of the world." ...and showed that he's just as much of a tourist as the rest of us when it comes to photographing spectacular views. "It is one of the most spectacular things I have ever seen. It is very beautiful, with the surrounding mountains it is an amazing view. The statue is fantastic. It is great to be in Rio. 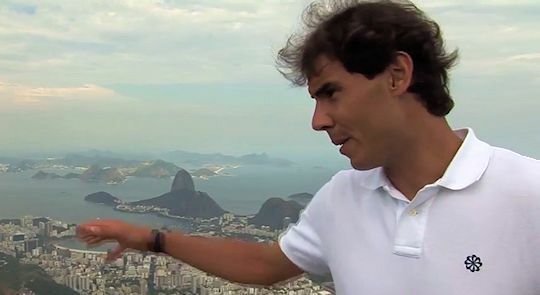 It is always nice to visit new places and Rio was definitely one of the places I wanted to be." The important thing, though, is that he's back out and practising on court. He'll play his first match on Tuesday.